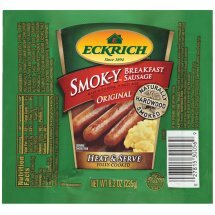 True Smokehouse Flavor - Eckrich Original Smok-Y Breakfast Smoked Sausage Links are slow cooked over natural hardwood for a rich flavor that's great any time of day. The Perfect Addition to Breakfast - A top-quality, special blend of savory spices makes for an unmatched, mouth-watering morsel for your breakfast table. Ideal for Brunch - These breakfast smoked sausage links are perfect for your favorite brunch recipes like frittatas, quiche and more. Meat Ingredients (Pork, Beef), Mechanically Separated Turkey, Water, Corn Syrup, Contains 2% Or Less of Dextrose, Flavorings, Autolyzed Yeast, Modified Food Starch, Mechanically Separated Chicken, Monosodium Glutamate, Potassium And Sodium Lactate, Salt, Sodium Diacetate, Sodium Nitrite, Sodium Phosphate, Vitamin C (Ascorbic Acid).